Click the button below to add the Maxpedition CCW Modular Holster to your wish list. The Maxpedition CCW modular holster is a universal holster for carrying a concealed weapon (CCW). The 2” retention strap of the holster is adjustable and fits any gun --- full size, compact and even subcompact handguns. The backside of the holster can be attached to the loop velcro sewn in most bags for concealed carry. The holster uses heavy duty velcro so you are assured that your gun will not accidentally slip. Adjust the loop of the Maxpedition CCW Modular Holster so it snugly fits your weapon securely. Attach the hook side of the holster onto the velcro sewn on your bag. Position as desired to facilitate draw. 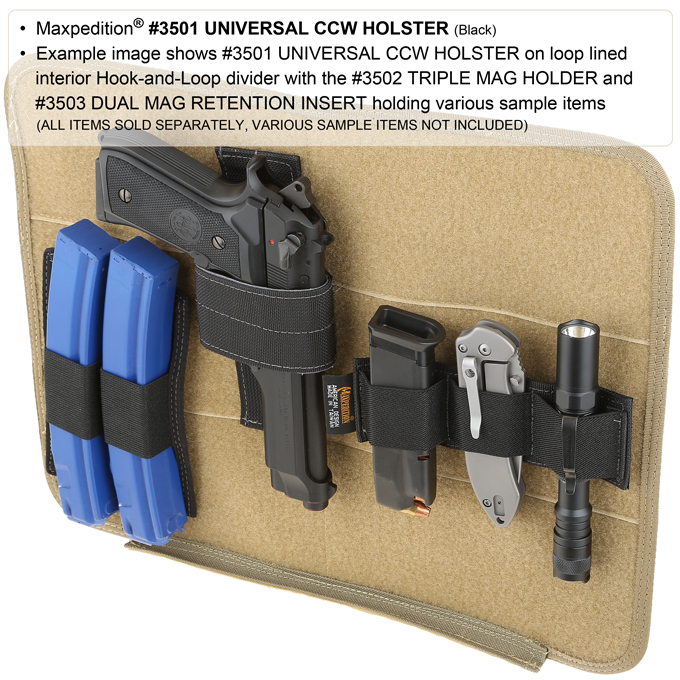 Note: The CCW Modular Holster is shipped with the loop flipped backward to prevent the hook from scratching other items. Just reverse it.